By partnering with the most dominant algorithmic design software company and creating a meta-data infrastructure with a flexible graphical super-system—to help visibly put that data to work—the Hungarian BIM software maker is positioning itself for the future. “We believe the workflow is the most important part,” was the way Akos Pfemeter, vice president of marketing at GRAPHISOFT, began our conversation when we spoke several weeks ago about the features and technology introduced with ARCHICAD 20. And it was from that opening line that we began to see how this year’s annual update was a bit different. For many years now industry observers and the press have often noted the way in which the Hungary-based software developer has been first to market with BIM technology that nobody else in the world offers. Items such as its ‘delta server’ technology in its BIM Server, advanced multicore processor support, predictive background processing, and of course its award-winning mobile app BIMx, all testify to that trend. Yet this year the direction changed. For ARCHICAD version 20, a major milestone release, GRAPHISOFT took a different tack. Arguably, still much ahead in several of those firsts noted above, GRAPHISOFT in many respects has bought itself enough time to actually turn its attention to the future and to greater workflow needs. That’s just what it did in ARCHICAD 20. So if the workflow is the most important part, what about that workflow has GRAPHISOFT decided to focus on? Well, this year that would be an extension of looking at BIM at both the beginning phase and the later phases of the building delivery cycle. In other words, extending BIM to the schematic design phase further than it has been in the past, and taking it all the way to post-occupancy phases and the importance of facility management (FM). This year in our post-AIA BEST of SHOW perspectives article, we discussed the importance of the Hype Curve as a left side / right side lens upon which we can discuss technologies in AEC practice. We can safely say that algorithmic design in architecture has clearly seen ‘supplier proliferation’ and ‘activity beyond early adopters’ and so we know that it has reached its ‘peak of inflated expectations’, as the Hype Curve denotes this phase for the technology that is algorithmic design. This marks an important milestone. Algorithmic design and computation design are not passing fads. They are cornerstone technologies in the future of architectural practice. As such, GRAPHISOFT has taken a specific strategic approach to addressing this milestone in algorithmic design’s evolution. If we want to look at the core issue here…we have to look at the current workflow in the “design” offices—typically the high-end design offices. It starts with a principal often making a sketch with paper and pen. Then the computer literate people—the youth—come in with algorithmic design modeling. Once the concept has been solidified to some extent, then the buildings-fluent people come in with the 2D documentation tools. There is a kind of beauty in Pfemeter’s description above because it almost bluntly and with succinct truthfulness describes a real phenomenon happening within the architectural world today that is—by its nature and association of being responsible for the architectural avant garde—also, and more than somewhat, blind to the architectural firm status quo. In other words, the phenomenon and its stakeholders don’t care that the status quo isn’t aware…this is evolution and revolution mixed. 01 – GRAPHISOFT’s Rhino-Grasshopper-ARCHICAD connection is a bi-directional link between all three programs that brings algorithmic design deep into the BIM workflow. As such, GRAPHISOFT aims to court high-end design firms around the world that are deeply invested in Rhino-Grasshopper workflows. Recognizing that algorithmic design is very much here to stay, and recognizing that many of its adherents are also not of the “automation” mindset but more like the Copenhagen firm BIG (Bjarke Ingels Group) which we profiled in a feature back in 2014, GRAPHISOFT is seizing on an unique opportunity. Many high-end design firms are not BIM aficionados or zealots nor are they technology Luddites either. They are in between and they are very much more concerned with the craft of architectural creation. As such, their favorite tools are things like Rhino and Grasshopper and 3D printers. They are firms that make zillions of models, both physical and digital, as part of their standard design workflow. And working drawings, the construction drawing phase, is the thing they love least. “We would like to help these firms come into BIM,” says Pfemeter, emphasizing that at least in one respect, many of these firms, were not so… how should we say it—”up-to-date” when it comes to working drawings production. They were stuck in the least common denominator that is 2D CAD, principally with AutoCAD. Pfemeter notes that the Rhino + Grasshopper + AutoCAD formula isn’t really all that new. “What is new is our way of connecting algorithmic design with BIM, and the way we do it with our connection…and it makes much more sense,” says Pfemeter. GRAPHISOFT makes an interesting and powerful argument when talking about capacities and specialization and best-in-class. Pfemeter argues that each company is solely focused on its specialization and capacities and will continue to develop their technology at full speed. GRAPHISOFT with ARCHICAD and McNeel with Rhino + Grasshopper. GRAPHISOFT also sees their partnering approach as a perfect reflection of their Open BIM philosophy. But it may also acknowledge something else—their faith in McNeel’s leadership over the algorithmic design software market. So in looking at this decision we learn something about how GRAPHISOFT thinks at a deeper level. We can see that it identifies its core competence by those things it has clearly rolled their own code on, while things that are outside that core competence—like algorithmic modeling—are either partnered with or licensed. For what it is worth GRAPHISOFT does indeed license technologies. 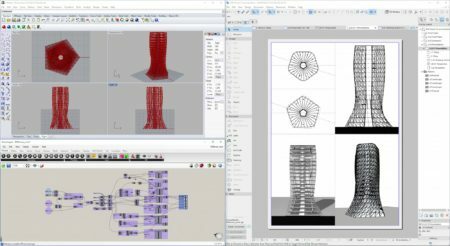 We have been covering in depth the thinking and background behind GRAPHISOFT’s approach to integrating algorithmic design workflows into the BIM workflow process. And yes, it very much is about that philosophy of “skating to where the puck is going to be, not to where it has been”—to reference a Wayne Gretzky quote that was a favorite of Steve Jobs. The company, which happens to have a bronze statue of Steve Jobs at its global headquarters in Budapest, is pretty good at doing just this thing. And so when it came time to rethink its user-interface design for ARCHICAD the company took another approach from the Apple playbook. They looked at the next generation of computer users who predominantly grow up now using mobile operating systems and applications as their first and primary computers. 02 – ARCHICAD 20 has a completely updated user-interface (UI) that is much more streamline, cleaner, less noisy and modern. 03 – A picture of some of the new icons in ARCHICAD 20…GRAPHISOFT looked at mobile apps for UI inspiration. The new UI on ARCHICAD 20 is both refreshing but yet logically consistent with what preceded it. Old-time ARCHICAD users will never get lost, know exactly where to go as before, but yet face a cleaner, leaner and more visually appealing experience. Interestingly, Pfemeter noted that they took the user-interface redesign so seriously, they invited multiple, leading user-interface designers to work on developing the new concepts. “More and more people are coming to us from mobile devices and to them a traditional desktop UI is frightening, in many cases,” says Pfemeter. Taking cues from leading mobile apps, of which their BIMx is one such app, they revamped the entire UI. We have thus far been framing this new update to ARCHICAD from the vantage point of how GRAPHISOFT is positioning itself to where the future of architectural practice lies. This started with the biggest shift in architectural design with the emergence of algorithmic design going mainstream. Then it looked at the future of the profession itself—the younger designers and users who come from computer backgrounds where their primary experiences are dominated on mobile devices first. o4 – A view of the new Property Manager for inputting meta data schema in ARCHICAD 20. However, the next key area where ARCHICAD 20 takes on large new functionality is all about data. Arguably information is the primary theme of this latest release and the company notes that it is through information (or data) that the BIM process is further extended into construction and post-construction phases. ARCHICAD 20 features the brand new Property Manager. This is the heart and sole of so much of what is new under the hood in this release. The new Property Manager presents the user with a predefined schema for meta-data about every element in a building. A wall assembly in ARCHICAD 20, for example, can have a Fire Resistance Rating assigned to it. Or it can have a Thermal Transmittance value, or both—and many other data assignments. 05 – From the Settings palettes the new meta data categories are selectable for assigning values to elements in the BIM model that are non-geometric and pertain to data far more useful to further phases of the building delivery-operate life cycle. Meta data is organized in the new Property Manager into a limited series of key categories, such as General Ratings (eg: Fire Resistance Rating, Combustible, Sound Transmission, etc), Product Info, Manufacturing, Main Construction and so on. For each type of element in the BIM model (eg: door, ceiling system, air handler, light fixture, etc) all or parts of the meta data categories are made “available” to these elements in the settings dialogs for these elements. So if you select one or all of the walls, and open up the Wall Selection Settings, you will see a drop-down for Categories and Properties listing the meta data options selected from the new Property Manager’s ‘Availability’ panel. Element properties can now be round-tripped via a new Excel to ARCHICAD functionality. For example the door schedule can be sent out of ARCHICAD to a door manufacturer or consultant as an Excel worksheet and that person can edit, send it back and that data will be updated in ARCHICAD. Perhaps the coolest new feature in ARCHICAD 20 is the new graphical overrides technology. This new tech enables both 2D and 3D views of the BIM model and meta data in all new, fully customizable graphical formats. This process works via new filtering technology. 06 – A ‘Fire Resistance Rating’ filter set quickly established a visual view of elements by their rating. These rules for ‘graphical overrides’ can then be applied to any View in ARCHICAD, for instant visual feedback on an infinite variety of conditions in architecture. The reason why this feature is perhaps coolest is because GRAPHISOFT doesn’t fully know how architects may use it; it’s a technology in ARCHICAD 20 that demands special attention because it’s a doorway into discovery both for ARCHICAD 20’s users and for GRAPHISOFT itself. 05 – Graphical Overrides in ArchiCAD 20 can also be used to due basic BIM model checking. In this example doors which do not meet ADA handicap requirements are quickly found and color coded red. Besides some default rules shipping with the product, users themselves may develop special “looks” for how their BIM models get graphical treatment in both 2D and 3D. But there is one more thing to say about the graphical overrides feature, and that is that it can be used for basic BIM model checking. With GRAPHISOFT still in firm command of is key rival in BIM in the areas of performance and platform flexibility, and with its mobile tool BIMx dominating the industry with both awards and actual usage, the company seems to have been able to utilize the past year for focusing on what will be necessary in the future of practice in BIM. How much these new changes in ARCHICAD, that are aimed at the younger generation, will inspire the next generation of architects to adopt ARCHICAD over rivals remains to be seen. Yet, powerfully partnering with algorithmic design software leader Rhino+Grasshopper puts GRAPHISOFT into unique territory unmatched by its rivals who have taken an all-together different approach. — ANTHONY FRAUSTO-ROBLEDO, AIA, LEED AP.